The National House Inn Bed & Breakfast is a historic inn that has been welcoming guests for over 170 years. 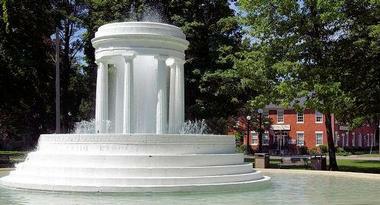 Located in Marshall in Michigan, the lovingly preserved building, which was built in 1835, overlooks the Fountain Circle in the center of the picturesque town, which is a National Historic Landmark District that is home to an array of beautiful 19th-century architecture. 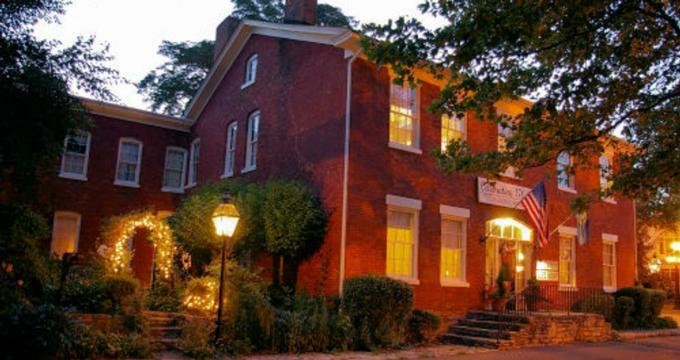 The National House Inn Bed & Breakfast features traditional guest rooms with country-style décor in soft floral accents and antique furnishings, private bathrooms, and modern amenities, including air-conditioning and fireplaces. The property is surrounded by beautifully manicured gardens and boasts a guest lounge with a fireplace where guests can relax. A delicious home-cooked breakfast is served with compliments every morning, and the Inn is within a short walking distance from the town’s restaurants, shops, and other attractions. The National House Inn Bed & Breakfast offers 15 charmingly decorated and furnished guest rooms with queen-size beds with plush linens, private bathrooms with showers and/baths, fresh towels and deluxe toiletries, comfortable sitting areas – some with fireplaces – and modern amenities, including air-conditioning. The Ketchum Suite is an elegant Victorian bedchamber on the first floor that features a master bedroom with a queen-size bed with plush linens, private bathroom with shower and/bath, fresh towels and deluxe toiletries, and an adjoining sitting room with a guest toilet that overlooks the garden. The Pratt and Pierce Suite is a delightful, country-style suite on the second floor with a large master bedroom, private bathroom with shower and/bath, fresh towels and deluxe toiletries, and an adjoining sitting room that overlooks the garden. The H.C. Brooks Room is a charming chamber on the second floor that overlooks the garden and features a queen-size bed with plush linens, private bathroom with a claw foot tub and separate shower, fresh towels and deluxe toiletries, and an electric fireplace. The Charles T. Gorham Room is a beautiful Victorian bedchamber on the first floor with a large master bedroom, private bathroom with showers and/bath, fresh towels and deluxe toiletries, and beautiful views of the Brooks Memorial Fountain. The Charles Dickey Room is located on the second floor and features a queen-size bed with plush linens, private bathroom with a claw foot tub and separate shower, fresh towels, and deluxe toiletries, and an electric fireplace. The Isaac Crary Room is a second-floor Victorian bed chamber overlooking the Fountain that features a queen-size pencil post bed with plush linens and a private bathroom with shower and/bath, fresh towels and deluxe toiletries. The James W. Gordon Room is located on the second floor and features a queen-size bed with plush linens, private bathroom with shower and/bath, fresh towels and deluxe toiletries, an armoire, and chest, and an electric fireplace. Located on the first floor, the O. C. Comstock Room is a charming Williamsburg-style room that overlooks the sitting garden and features a queen-size canopy bed with plush linens, and a private bathroom with shower and/bath, fresh towels and deluxe toiletries. The Adam Crosswhite Room is a delightful bedroom on the second floor with twin beds in plush linens, and a private bathroom with shower and/bath, fresh towels and deluxe toiletries and the Sam Hill Room is decorated in soft rose accents and features one double bed and one twin bed with a private bathroom. 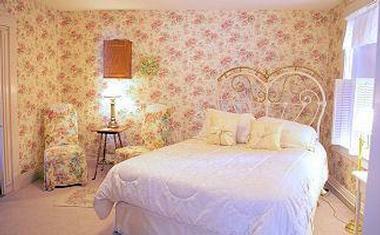 The George S. Wright Room is a cheerful country-style room that overlooks the sitting garden with a queen-size bed in plush linens, and a private bathroom with shower and/bath, fresh towels and deluxe toiletries, while the Horace J. Perrin Room is a simply decorated room on the second floor with a queen-size bed. The Anne Ells Room is a cozy second-floor chamber with antique furnishings, a double bed in plush linens, and a private bathroom with shower and/bath, fresh towels and deluxe toiletries. 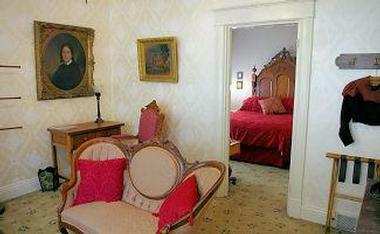 The Andrew Mann Room has a beautiful walnut double bed, burgundy walls and a private bathroom with shower and/bath. The William Wallace Cook Room is a delightful, country-style bedroom with a queen-size iron bed with plush linens, private bathroom with shower and/bath, fresh towels and deluxe toiletries, an armoire and white pine rockers. A complimentary home-cooked breakfast is served each morning and includes a variety of delicious items including fresh fruit, freshly baked pastries, waffles, eggs, juice, and coffee. Breakfast is served in the beautiful 19th century styled dining room which features antique oak dining tables and chairs and intricate paintwork. 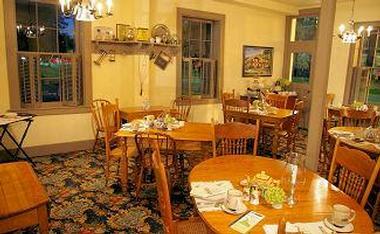 In addition to charming guest rooms with country-style furnishings, the Inn has an elegant parlor and lounge with majestic beam and brick open-hearth fireplace, plush sofas and comfortable armchairs in which to relax, as well as an upstairs sitting room with a fireplace and hand-crafted cabinets. A complimentary breakfast is served in the dining room every morning and afternoon tea including a variety of teas and sweet treats in the parlor adjacent to the dining room. Freshly popped popcorn is available to snack on each evening, and the Tin Whistle Gift Shoppe, which is located next to the dining room offers country-style gifts and antique items. The National House Inn Bed & Breakfast caters for small business meetings, special celebrations, and gatherings of friends and family of up to 25 people. The private Ketchum parlor can host up to seven people, and there are several areas for break-out meetings including three cozy sitting rooms, a beautiful garden and back porch.